Most common complaint for this problem is a pain in the back of the heel and stiffness. Or even a bump on the back of the heel. The xray below shows an unfortunate patient with two types of spurs in the back of the heel that can cause a problem with the achilles. Not to mention a large spur on the bottom that is currently not symptomatic. Red: is the Haglund's deformity AKA pump bump, common in old fashion days when pumps were popular and the back the pump rubs against the back of the heel bone. 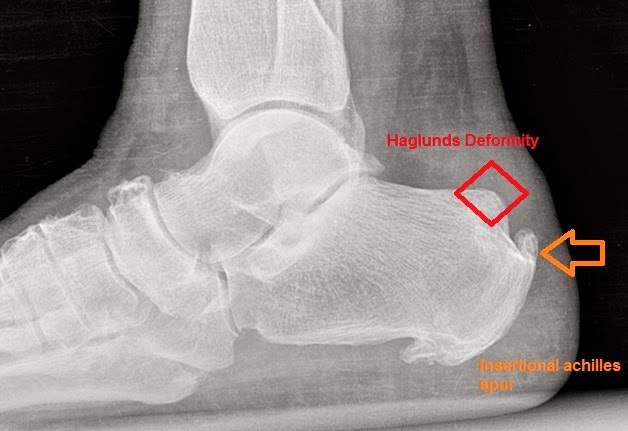 Orange arrow: points to the spur within the achilles tendon. 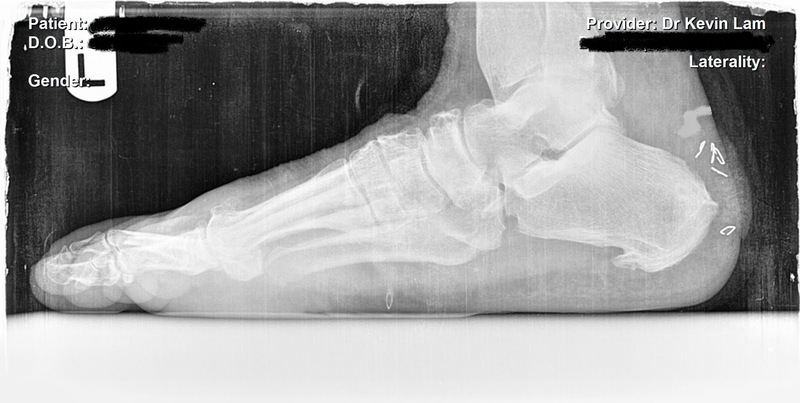 As you can see there is a shadow of the achilles noted in the back of the heel bone. It is also very inflammed in nature as noted with the thickness noted in this xray. MRI's are more telling of the actual tendon inflammation, injury and likely partial tears of the achilles. By the time a patient presents to me with these xray findings they have been having pain for some time already. Not all patients with these xray findings will require surgery. Conservative care with anti inflammatories, physical therapy, shockwave therapy, massage therapy can help the condition, but if the pain persists beyond conservative care, surgical care will be required. Below shows an xray of the same patient 2 weeks post operatively. Notice the two noted spurs have been removed and staples in place for skin closure. No pain at the 2 weeks mark and able to stand on the foot, not walk yet, but can stand. Will allow range of motion at 4 weeks, then therapy and a boot to be used at 6 wks. 7/22/2014, stay tuned /subscribe for updates as the patient heals from her successful surgery.